Bible of John Benner Loose and Mary (Kensinger) Loose of Henrietta, Pennsylvania, in Blair County. Henrietta appears to be a village in North Woodbury Township. Most of the entries refer to "my wife, "my son" and "my daughter", so were presumably inscribed by John Benner Loose himself. The exception is the birth date of John B. Loose, which is in a different hand, presumably Mary's. The Bible measures approximately 11-1/2" by 9" by 3-3/4". The covers have separated and the beginning of the Bible is in sad shape, with pages missing, including the title page for the Old Testament. The interior is in much better shape, including the Family Record pages and the New Testament title pages, including what appears to be a hand colored engraving, as shown below. The Bible was published in 1860 by the William W. Harding Company of Philadelphia, Pennsylvania, and printed by Jesper Harding & Son, 57 South Third Street, Philadelphia, Pennsylvania. The Marriages page is blank. Birth dates are recorded for John Benner Loose and Mary (Kensinger) Loose and their eight children. The only death recorded is that of daughter Barbara, who died September 21, 1857. The death of father John Benner Loose, who died in 1864, is not recorded, so it appears that the Bible ceased to be used for family recording purposes sometime between 1857 and 1864. According to a Find-a-Grave memorial, John Benner Loose died in 1864, how long after the birth of his son David, I don't know. Many family members, including John and Mary, are buried in the Nicodemus Cemetery at Henrietta, Pennsylvania, listed on the map as within the town of Martinsburg. Tucked in the album is a tiny card that notes that Barbara Loose attended School for 17 days and was a "GOOD GIRL". It's dated August 1856 and signed by teacher Longenecker. 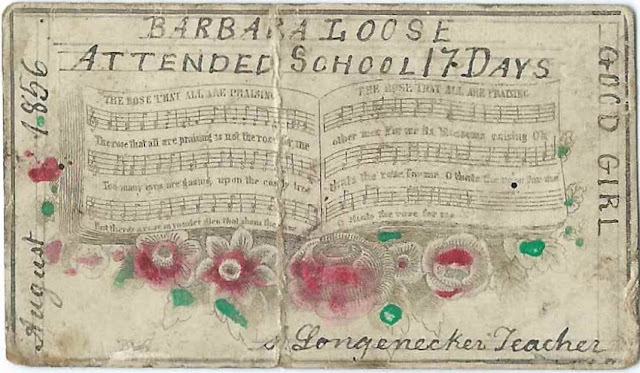 The card has a crease that runs through the teacher's first initial, but it could be an S. Sadly, as noted above, Barbara would die a little more than a year later. If you have information on the John Benner Loose and Mary (Kensinger) Loose family, please leave a comment or contact me directly.